Whether it is tea time or simply your first meal of the day, our local version of cake, kueh, comes in the perfect proportion to chomp down on a few, or to stop at one if you’re not too hungry. Kuehs or kueh kueh may be richer or more decadent in ingredients than their Western cousins. So, be careful not to have too many. 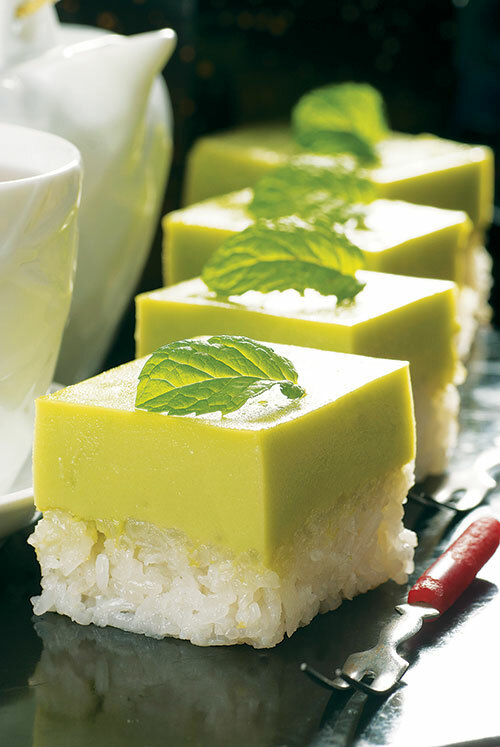 These colourful snacks may look deceptively light, but just one bite of the kueh brings forth the rich flavours of pandan, coconut milk and grated coconut. Still, these are what make them taste so good. Here are a few shops to try kueh. This shop has been around since 1967 and is popular for their multi-coloured jiu cheng gao, also known as Kueh Lapis Sagu. Only their version has ten layers with a white base. Ang ku kueh or “Red Tortoise Cake” is a popular snack among Singaporeans. With flavours such as green tea and yam as well, you’ll be spoilt for choice. They also sell lumper udang and lumper ayam. Visit www.amknonyakueh.com for their outlets. If you are a fan of kueh dar dar, harum manis or apam pisang, or would like to try them, check out Malay Kueh. This place is also delivers and caters for orders in bulk. Visit www.malaykueh.com for more information. This Peranakan restaurant also sells colourful and delectable kueh. Handmade favourites such as kueh chendol, kueh dar dar and ondeh ondeh are available.